St Denys, Rotherfield01892 852536work ChurchFounded in 792AD, St Denys’ Church is one of the oldest in Sussex. The present sandstone church dates from 1060, with later additions including a 15th Century tower and porch. This glorious village church is a symbol of the sturdy men of Sussex who built it long ago. The whole pageant of English history for 1200 years is bound up with this church; the forest men, the Norman soldiers, the hunted fugitives, peasants and farmers, the iron workers and the service men and women who prayed in this church in the dark days of two world wars. The Nevill Chapel has medieval wall paintings, a Tudor fireplace and Easter sepulchre. The east window is by Burne-Jones. There is a 1500 year old yew tree in the churchyard. 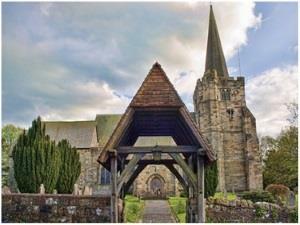 Founded in 792AD, St Denys’ Church is one of the oldest in Sussex. The present sandstone church dates from 1060, with later additions including a 15th Century tower and porch.